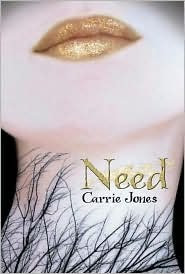 Need by Carrie Jones is not what I expected. I go through phases of being turned-off by paranormal YA and phases where all I want to read is something a little more fantastic. I'm going through a latter phase at the moment, and I think I picked up this book at the perfect time. I love the quirkiness of Need. The main character, Zara, is obsessed with phobias. There's a phobia for everything from fear of flying, to peanut butter to the fear of being alone. Zara believes that if you give something a name it makes it less scary. And she needs that sort of comfort at the moment, as she's just lost the only father she's ever known. And in her depression and grief, her mother doesn't know what to do with her. So, she sends Zara away from her home in Charleston to a cold sleepy town in Maine to live with her grandmother. Even before leaving Charleston, Zara has believed that someone's been following her, stalking her even. She hopes that by coming to Maine, the man will have disappeared. Only he hasn't. She sees him just outside the airport, and again at school. He points at her in a really creepy fashion. Luckily, Zara falls in with a friendly bunch of students at her new school: Devyn, whose recent accident sees him now in a wheelchair; perpetually happy Issie and hot loner Nick. With her new friends' help, Zara must discover who the man stalking her is, what he wants from her and how to protect herself, her grandmother and her new friends. I knew beforehand that the paranormal creature we're dealing with in this series of books are pixies. I'm not an expert on pixies at all. They seem like a type of fairie and I'm not a fan of fairie fiction, but this one worked for me. There was enough plot-wise that I wasn't aware of to keep me surprised and guessing. I liked the friendship between Zara and Issie and Nick was suitably hot. I'd have liked a little more tension and build-up, but that isn't a big issue. A huge thank you to Bloomsbury for providing me with this copy for review. Pixies are the new fairies then.LOL. I didn't know it was about pixies. That is a change from the norm. I am glad to hear it is good and do trust your judgement. Vivienne - Oh, I hope that didn't spoil anything for you. I knew beforehand that it was pixies and it didn't stop me from enjoying it! It is quite good, I was a little surprised, as I really don't like fairies in books at all. But yeah. Looking forward to the next books in the series! Plus? Gorgeous covers, all of them. Reading this review, I jumped every time I read "Zara." I am so not used to seeing that name when it doesn't mean me. :) It sounds like a great book, though. >>>Zara believes that if you give something a name it makes it less scary. Oh, gosh, so true to me. I love it when I discover a new word that describes something I have experienced but didn't know there was a name for. It makes the world feel so organized! Zara - AHAHA :) I didn't mean to confuse you. It's not a very common name, is it? But it has specific importance in this book! Jenny - I know exactly what you mean! :) I always get a thrill when I learn those words.